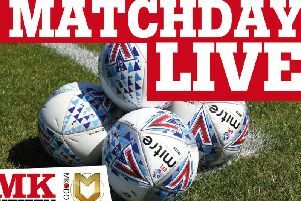 Robbie Neilson wants his MK Dons side to string together a run of performances after his side spluttered again in the 0-0 draw with AFC Wimbledon on Saturday. The Dons boss feels his side are struggling to perform in back-to-back games, and it is costing them dearly in the league. Saturday's 0-0 draw, twinned with Northampton's 2-1 win over Bradford City, means Dons are just a point above the drop zone with a trip to Sixfields next weekend. "We've lacked consistency," explained Neilson. "We were great against Peterborough but didn't perform against Oxford. We were great against QPR and came here and it wasn't as good. "We've been hindered massively by injuries and suspensions, but we hope to get that continuity in the team now. "We're disappointed not to take three points. It was one of those games where everyone knew the magnitude of the game - how close we are at the bottom, the rivalry. But neither manager can complain about the effort of the players, but there was a lack of quality. "In the last few games, we've passed it really well, but today we didn't. We had a great chance and probably should've scored. Over the course of the game, neither side really opened up. At home, we should be doing that." With Dons and AFC struggling at the wrong end of League 1, Neilson said both sides were battling with nerves as well as the derby-day implications for the fans, and it played against both sets of players as they looked more keen not to lose than to go out and win. He said: "There were nerves from both teams because we knew the importance of the game. There were periods where we played well but we have to do it for the full game. "We did so well last week, but the game and magnitude of it, and perhaps being at home too has an influence but we have to get over that. We need to show resilience to go and get the ball and move it. When we did that, we got into good areas. "It was a game neither side wanted to lose, you never want to lose a derby, especially where we are in the league. But at home, we have ot rise above that an put in a performance that merits a victory."